Mediation (concerning SEN) is a process during which independent, impartial and individual attempts are made to settle a dispute between parents of a child with SEN and Local Authorities (LAs) or schools so that an amicable agreement can be reached that everyone is happy with and agrees to abide by. This then means that there is no need for further action such as an appeal or complaint. Mediation is voluntary and confidential. 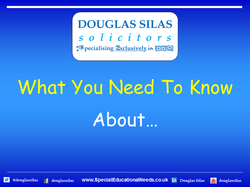 It is independent of other procedures being followed and does not affect the right to appeal to or a current appeal to the SEND Tribunal. Mediation falls under the umbrella of ‘Alternative Dispute Resolution’ (ADR) or ‘Conflict Resolution’. Mediation is not just negotiation. Disagreements sometimes arise about the needs of a child with SEN. The parents of the child might have a different view of their child’s needs or the provision that they require than the LA and/or school do, are providing or may be suggesting. They may consider that an appeal or complaint is the only way forward. Mediation can be used to resolve disputes positively and is often a quicker and more cost-effective solution than appealing or complaining. It can also lead to agreements to do things and outcomes which an appeal or complaint may not be able to achieve. SEN Mediators are independent, impartial, facilitators. They are trained in the field of mediation and are familiar with SEN law and framework. The main goals of an SEN mediator are to improve communication and create an understanding between the disputing sides and help them see each other’s point of view, including the strengths and weaknesses of their case. "WHAT HAPPENS IN A MEDIATION?" All parties have to agree to attempt mediation for it to take place. Initially, opposing parties each attend meetings with the mediator individually to discuss the situation from their perspective or points of view. After this has happened, the parties meet together with the mediator. During the mediation, each party has the opportunity to explain their point of view and to discuss the situation both with the mediator and then with the other party. They are also asked to actively consider possible practical solutions to the issues, including not only the present situation but the future. If a mutually acceptable agreement is reached, the mediator records it in writing and the parties then sign it and are given copies of the agreement. If there is no agreement reached, the mediation proceedings remain confidential and cannot be used elsewhere (such as in an appeal or complaint). "WHAT ARE THE POTENTIAL BENEFITS OF MEDIATION?" Mediation can result in an outcome which all parties are happy with. It can also be less expensive and less time consuming than an appeal or complaint. Also, the style of the meeting may lead to more open communication and amicability between the parties. Unfortunately, some people have developed a negative view of mediation over the years and have criticised it. They argue that it does not help disputing parties and is just a distraction to a more formal appeal or complaint. Some even say that it requires compromise which leaves everyone unhappy with the outcome afterwards. This is misleading and an over-simplified view of the process. Mediation can be used constructively to resolve any SEN dispute.